Williams has been one of the most dependable Formula One teams when it comes to the livery department. Since 2013, its cars have bedecked in white with the blue and red Martini racing stripes that have become almost synonymous with the modern Williams name. 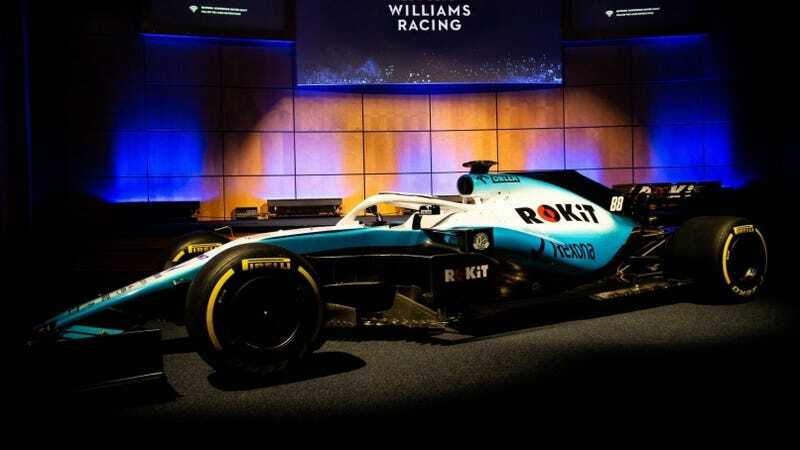 But things are about to get a shakeup for the 2019 season: Williams has a brand new title sponsor and a brand new livery to lead into their next era of racing. The livery reveal took place at the Williams factory on Monday afternoon. While the actual, physical car won’t be seen in action until pre-season testing later this month, the team showed off a pretty neat video revealing the new baby blue and white livery. I’m not gonna lie, it’s a pretty neat way to start off the season. I’m a big fan of teams who make drastic livery upgrades. And I think we lucked out here—ROKiT’s logo design is black, white, and red. Opting for a cool blue to differentiate the team from, say, Ferrari or Alfa Romeo (formerly known as Sauber) is a smart move. It’s bright, unique, and a welcome offset to the darker Haas and Renault liveries.